The principle aim of this 1990 book is to encourage readers to find pleasure in sixteenth-century tragedies. To this end, Gillian Jondorf examines a range of plays (all accessible in modern editions) in two ways. She suggests, by means of comparisons with other works, that techniques such as allusiveness need be no more forbidding in humanist tragedy than in, say, Racine or Lamartine. She shows how other features, such as characterization, structure, and the use of Choruses, become not only comprehensible but satisfying when the guiding theme or idee maitresse of a play has been identified and its organizing principles understood. Dr Jondorf argues that these plays should be seen not as pardonably clumsy experiments by the first practitioners of a genre, but as competent works which display skilful deployment of technique in the service of dramatic aims which are, in the broadest sense, didactic. 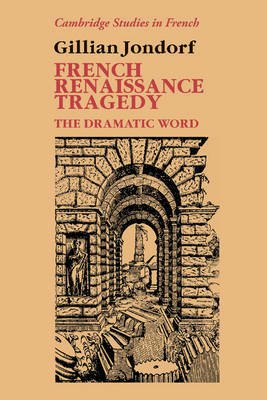 French Renaissance tragedy has too often been treated, even by its defenders, merely as a staging post on the road that leads to Corneille and Racine. This book corrects that perspective.